Sri Lanka cuisine has been shaped by many historical, cultural, and other factors. Foreign traders who brought new food items; influences from the cuisine of Southern India have all helped to shape Sri Lankan cuisine. Today, some of the staples of Sri Lankan cuisine are rice, coconut, and spices. The latter are used due to Sri Lanka’s history as a spice producer and trading post over several centuries. The central feature of Sri Lankan cuisine is boiled or steamed rice, served with a curry of fish, chicken, beef or mutton, along with other curries made with vegetables, lentils, or fruits. Dishes are accompanied by pickled fruits or vegetables, chutneys, and sambols. coconut sambol is especially common, a paste of ground coconut mixed with chili peppers, dried Maldive fish, and lime juice. Sri Lankan spicy and aromatic cuisine has gained recognition and popularity as being one of the world’s finest. Some of the most famous delicacies are hoppers, red, white and black curries, milk rice and yellow rice. The Sri Lankan cuisine is extremely wide and it gained recognition due to the Portuguese, British and Dutch invaders, Arab, Indian, Malay and Moor traders. The main Sri Lankan dish is rice and it is usually served with vegetable curries, Beef, fish, Chicken, egg and mallum. Vegetarian curries are made from fruit or vegetable like brinjals, carrot, beetroot, beans, pumpkin, ash plantains, or banana flower. Sri Lankan curries are much hotter than those in India and made with chilli powder, cinnamon, fresh chillies, curry powder, curry leaves, tumenic, garlic, onions, ginger and coconut milk. Sri Lankan people prepare fish according to a wide variety of recipes; however, ‘Ambul Thiyal’ is the most famous fish curry which can be found especially in the southern part. There are some unique Sri Lankan specialities such as hoppers, which people usually serve for breakfast or lunch. There are several varieties of hoppers like egg hoppers, milk hoppers, or string hoppers. After meal, Sri Lankan people have pittu, which is a mixture of flourand grated coconut steamed in a bamboo tube. Another popular Dutch dish is lamprais, which is rice boiled in beef stockand added to meat and vegetables. Like every cuisine of this world, Sri Lankan cuisine has its own secrets, as well. Thus, baking the rice in banana leaves gives an extraordinary flavour to the rice. Then, Sri Lankan people say that the best way to enjoy their food is eating with your fingers. All the communities have adopted rice as the staple food. Usually, the midday meal is rice and curry and for such a meal, everything is put on the table at once: fish, rice, meat curries, soup, and vegetables. Desserts are unknown except on different festive occasions. Another rule seems to be the fact that almost every meal ends with mangoes, pawpaws, bananas, mangosteens, rambutan, avocados, and watermelon. Every meal has to contain curries, which are always classified in accordance with the type of spicing, or the method of cooking; they can be red, white, or black. Red curries are based on few spices and a large amount of chili powder or ground chilies. White curries contain coconut milk and there is no doubt that they are usually mild and have a lot of liquid. Finally, black curries proved to be the most mypical in Sri Lanka; their dark colour is given by the coriander, fennel and cumin. 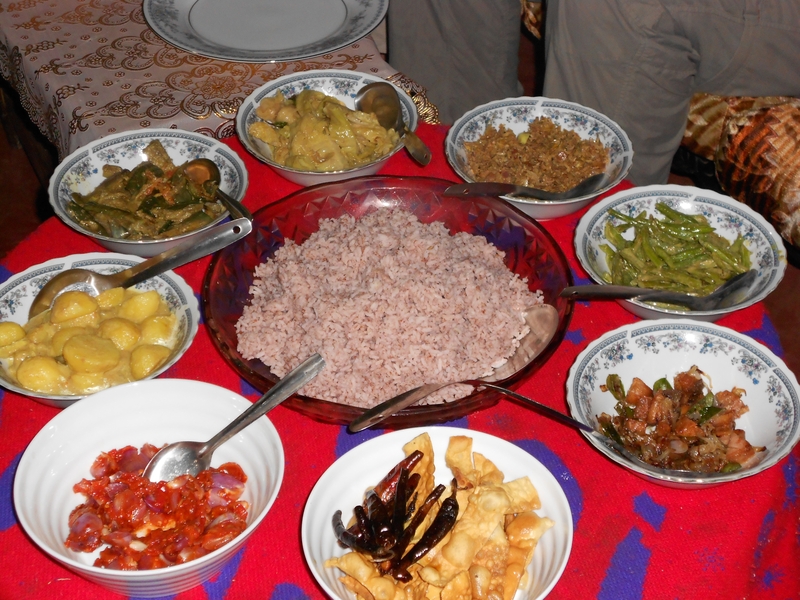 The Sri Lankan home cooking program instructs groups to prepare authentic Sri Lankan rice and curry. We get all the vegetables and the meats and get together with the group to cook the meal. We will instruct you how to cook more than five different dishes and for the desert we will teach you how to make banana fritters with treacle. We will end it with Sri Lankan tea or coffee. Our kitchen can accommodate about 25 guests comfortably. Groups that have participated in the cooking program have enjoyed themselves very much! Wash the Dhal well and add sufficient water. Then add unroasted curry powder and turmeric powder and cook well. When the Dhal is done add salt to taste. Now add a little coconut milk and take it out of the stove. Take the skin out of the chicken and cut it into suitable pieces and wash well. Drain the excess water and add all the (a)Ingredients. Mix well and set aside. Then heat a pot and add a little cooking oil. When it’s hot add the sliced onions and brown it well. Then add all the (b)Ingredients. Option 1: Grind all the above ingredients (except lime juice) in a stone motar. Add coconut and grind more till all the ingredients are mixed well and the coconut becomes red color. Add lime juice, salt to taste and mix well. Wash the cabbage well and shred or cut it into very small pieces. Add some turmeric powder and salt with a little water and cook for a while. (cabbage contains water so don’t add too much). Chop the garlic and green chilli. Then add shredded coconut, mustard powder, lime juice, curry powder, curry leaves and chop everything together using a food processor or a grinding pot. Add the coconut mix into the cabbage and stir well. When the coconut mix is cooked remove from fire. Instructions:Cut the eggplant into 2-inch pieces and deep-fry them until light brown.Cut the onion into small pieces, then mix the onion pieces, turmeric, black pepper, salt chili powder, curry leaves and garlic with the coconut milk in a small deep-frying pan.Heat the frying pan on low fire and stir for 3 minutes.Add the deep-fried eggplant to the pan, stir well and cook for 2 minutes on low fire. Enjoy your Sri Lankan eggplant curry! Instructions:Wash the beans and cut them in 1-inch long slices.Cut the onion into small pieces.Heat vegetable oil in the pot and fry the onion pieces and curry leaves until light brown.Add beans and leave it for 5 minutes on low fire while stirring.Add the vegetable curry powder, black pepper, turmeric powder and salt.Cook for 20 minutes on low fire.Check regularly if it’s boiling and add a half cup of coconut milk as soon as it reaches the boiling point.Cook for 5 minutes on low fire.Taste to see if there’s enough salt, add more salt if necessary. Cooking Instructions:Peel the potatos and cut into cubes of 1 inch each. 2. Boil the potatos in hot water with three pinches of salt until the potatos are soft and put them away. 3. Cut the green chili open and cut the onion into small pieces. 4. Fry the onion and green chili on medium flame with the vegetable oil, curry leaves and pandan leaves until brown. 4. Add the chili pieces and stir well for 5 seconds, then add the potatos. 5. Leave it cooking on low fire for 5 minutes and keep stirring well.